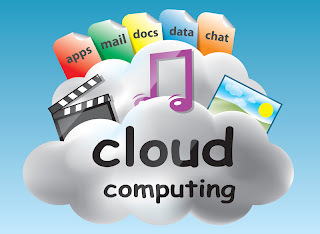 A lot of internet users like to share and store photos, documents and videos using a remote Internet file hosting service, also known as cloud storage. As a result, the need for email attachments and flash drives are eliminated. This even works well for anyone who has either a slow computer or connection; for they don’t have to wait for a file to download. Also in regards to cloud storage, everyone is focused on the security it provides. This is important with so many computers being compromised. Thus, given the overall popularity of cloud storage, I conducted some technical research on four cloud storage options: SpiderOak, Google Drive, Dropbox, and SugarSync. SpiderOak: Although it’s reported as one of the most secure online backup tools, I wasn’t entirely impressed with this application. This is because I found it to be fairly unstable. What made it worst for me was the fact that I found my data often wasn’t in sync. This is basically a technical app and the user interface lacked any mastery design. Aside from this experiment, I don’t use SpiderOak anymore. Instead the three applications I use are Google Drive, Dropbox, and SugarSync – all three which I tested. As part of my experiment, I monitored the traffic of these applications while nothing was happening. It’s normal for these applications to phone home on a regular basis to see if anything is syncing. In my opinion, having this occur more than once a minute is just too much occurrence. It would be better instead to have advance settings around this type of activity. To prove my point of opinion consider this: if you’re primarily using cloud storage to have a second copy of your data instead of syncing it, then there’s really no need to keep the connection alive. In actuality, based on how many computers you sync, the software should be able to adjust automatically. Since my laptop has 3G, I used it for testing as well as over Wi-Fi to see if there’s any difference in syncing. There was no difference found. Google Drive : I do not hesitate to state that Google Drive is the worst for keeping a connection alive. It’s unclear as to why it needs to phone home so frequently when nothing is happening. All of its requests are sent securely over SSL. Dropbox: This is the second chattiest cloud storage option. On the good side, however, it was only sending about one a minute. This seems more respectable and they’re sent as clear text over http. There’s nothing secretive about what Dropbox sends, so overall it makes sense to save an additional overhead of SSL. It does, however, use SSL while sending any of the important data. SugarSync: This cloud storage is similar to Dropbox yet appears to phone home less often. These calls are made over SSL like Google Drive. 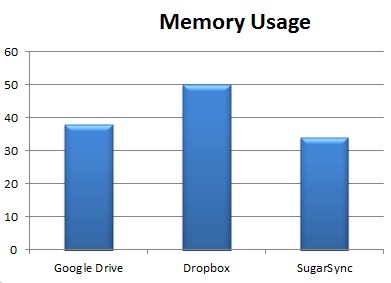 At 35Mb, SugarSync used the least memory while Google Drive followed a close second with 37Mb. Dropbox required the most memory for running: 50Mb. Of the three web-based file hosting services, Dropbox sent the fastest and the most traffic. Google Drive sent the slowest and least amount of data. While slow is oftentimes acquainted as being bad in the technology world, in this case, it’s not. Instead it simply means it’s less likely to cause complications with other applications competing with bandwidth. Nevertheless, it would be nice for it to have better quality of service and when there’s no competition against it, go as fast as possible. For those times when you’re either busy or changing several files multiple times, being capable of pausing syncing for bandwidth reduction is extremely useful. I like the fact that Google Drive doesn’t phone home if you pause it. Dropbox, on the other hand, continues to phone home, which I think isn’t necessary. I was unable to find an easy way to pause SugarSync, which in my opinion, is a shame. In conclusion of my experiment, I still prefer Dropbox. However, I’d like to see some more smarts to minimize the footprint on my computer and connection. If you’re interested in integrating with their other offerings, then Google and Microsoft’s cloud storage makes sense. If, however, you’re an iPad or iPhone user, then Dropbox is by far the best option at this time in technology. I think it is important to note that I would not use any of these services for backup and there are better solutions that focus much better on online backup.